As one might imagine, there is a certain process to writing that begins with an idea, followed by fleshing out and brainstorming the idea into enough of something that may be created, and then comes completing the first draft. At this point, one might be tempted to think that the most difficult part is over. After all, once you have a finished working manuscript, how much more is there really to do with it before releasing it into the world? 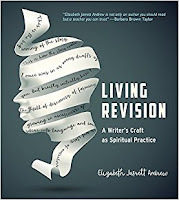 According to Elizabeth Jarrett Andrew's Living Revision: a Writer's Craft as Spiritual Practice, the first draft still may be close to the beginning of the project. At this point, she says, it's time to go back and go through revisions. This may include actions such as taking the big "Aha" moment at the conclusion and moving it to the beginning, effectively flipping and morphing the entire focus of the story or essay. It may include asking difficult questions about why certain passages or characters are included; whether they serve any kind of critical purpose and, if so, how one might need to enhance that purpose to strengthen the piece. It may include taking a 400-page manuscript and, after asking honest and critical questions, cutting out 200 pages of it. Revision, Andrew says, can be a long, involved, frustrating, and rewarding process that ultimately makes one's writing stronger and helps it say what it needs to say in the most helpful and insightful ways. It is the time during which one may ask what the "heart" of a particular work is and retooling everything around it in order to serve it best. It is the time during which one also really discovers what a manuscript really is, which may not have been as clear earlier even if the words were flowing through fingertips onto the keyboard. It also may be a time when the writer discovers something about oneself, because understanding one's message is also understanding something about the experience and identity of the writer. It is this last point that Andrew uses to cast revision as a spiritual practice. In crafting a piece of writing, one has particular motivations for doing so. Not only that, but he or she has experiences and beliefs that influence the ways the piece takes shape. The more one engages in a sort of dialogue with the parts involved, the better one understands both the emerging creation and oneself as the creator. One example that Andrew uses is a writer including a character's aunt in their story. After a trusted reader asked about why they bother to have the aunt around, they went back to think for a while about the answer. Eventually, the aunt was incorporated as a much more pivotal part of the narrative. The book is set up in a straightforward manner, with Andrew beginning with a long section introducing the concept of revision as well as clarifying preconceived notions about what it is and is not. After this, Andrew moves to what revision looks like at various points of the overall writing process, both earlier and later, with extensive tips on how to implement her concepts. I think that writers will experience Living Revision as drinking from a firehose. It is so jam packed with helpful hints, exercises, and examples that the reader will want to move slowly through all she has to offer. Only repeated readings or careful note-taking will help keep track of the considerable amount of wisdom that this book contains. But such meticulousness both in reading and in revising promise a better quality of writing, and thus better ways to gift one's art to the world.